MIDNIGHT: Catholicism Meets Satanism In The Schlock-Horror Backwoods – Schlockmania! John Russo never quite became a brand name in the horror world but it wasn’t for a lack of trying. He’s best known for his co-screenwriter credit on the original Night Of The Living Dead but he has devoted much of his life to the genre, both in print and on screen. 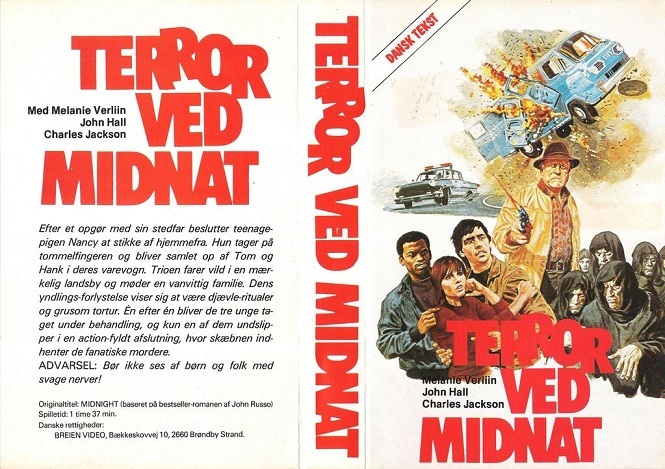 He wrote a lengthy string of paperback-original schlock horrors starting in the mid-1970’s and occasionally adapted these novels as feature films. Midnight was the first of these adaptations and it’s far from a great horror film – but it’s an interesting one, for reasons discussed below. 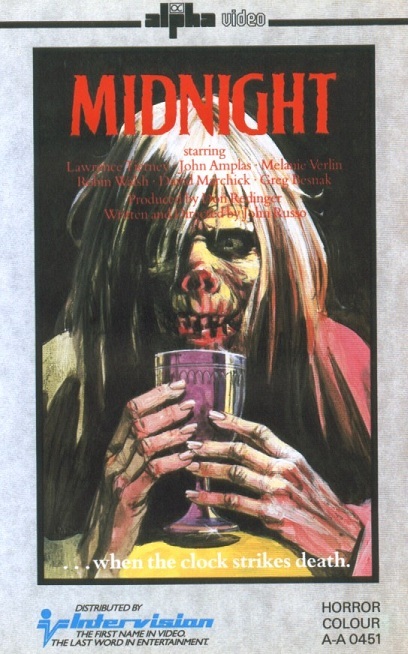 The plot of Midnight revolves around Nancy Johnson (Melanie Verliin), a teen who flees her home when her alkie cop stepfather Bert (Lawrence Tierney) attempts to molest her. She hitchhikes out of town, finding a ride with Tom (John Hall) and Hank (Charles Jackson). These two are traveling cross-country and keeping their expenses low by sleeping under the stars and shoplifting at grocery stores. Nancy falls right into the swing of things, despite Hank being uncomfortable with her runaway status. Unfortunately, the trio’s schemes are upended when they are awoken from one of their campouts by a pair of nasty cops (one played by a post-Martin John Amplas). Nancy manages to escape and begs the denizens of a nearby home for help: unfortunately, said house is home to a Satanist family gathering victims for a series of ritual sacrifices – and the “cops” are part of this family. In short order, Melanie finds herself locked in a dog cage as she awaits the next sacrifice. Her only hope lies in her stepdad, who has come to regret his actions and has set out to find her. 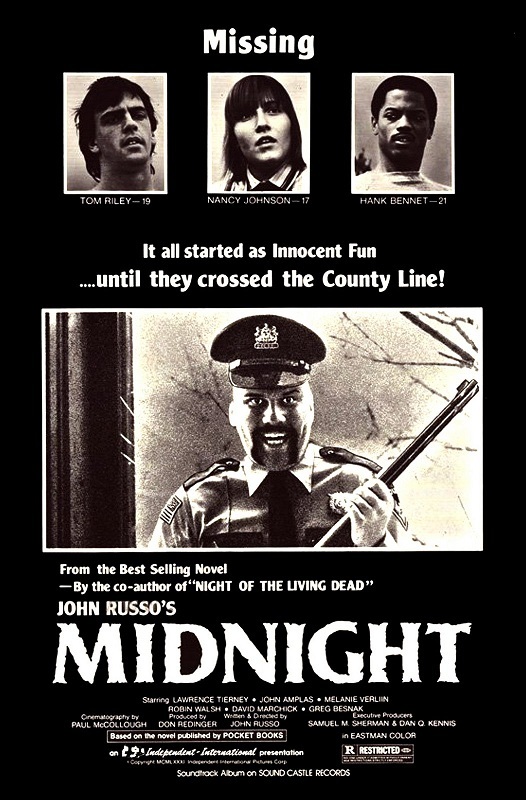 In terms of quality, Midnight is a far cry from Russo’s Night Of The Living Dead past. The visual style is primitive, the story is padded with throwaway dialogue scenes, the dialogue is loaded with clinkers and most of the acting is awful in that painfully earnest way unique to regional low-budget films. Russo just isn’t a natural when it comes to filmmaking and the end result feels like a particularly threadbare film-student project. That said, Midnight remains oddly watchable despite these many problems. For one thing, the cheapness and ramshackle quality of the film give it a sort of down-and-out vibe that enhances the grit of the horrific moments. The dingy rural locales are used to good effect and lend it the Yankee version of a “Southern Discomfort” feel. More importantly, Russo doesn’t tread lightly when it comes to the horrific bits. His technique might be crude but the black-mass and murder scenes have a cold, cruel quality that packs a punch. It also helps that Tom Savini lent a few minor but convincing splatter effects for these scenes. Better yet, Russo adds one unique and fascinating element to the film: instead of lapsing into the expected shock-coma, Nancy gets in touch with her inner religious zealot when she finds herself trapped in the cultist’s dog cage. She recites every bit of Catholic-school dogma she can muster and the scenes where innocents are slaughtered as she fervently prays for their departing souls carry a real charge. There’s even a brief scene where the priestess of the coven engages her in a philosophical debate about how a loving God could allow her to end up in such a terrible situation. Ultimately, Midnight is difficult to make a case for but if the selling points described above intrigue you, it’s worth a look for curiosity’s sake. What a coincidence. Arrow Video have just announced today that it’s one of their August DVD releases. Looking forward to seeing this. Thanks for the comment and also for sharing the link to the review. It’s much appreciated! As for the film, it’s not exactly good but it’s definitely interesting… and sometimes with low-budget schlock, that’s all you need.